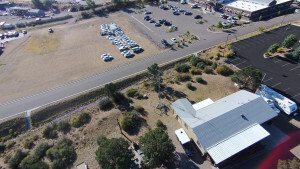 Our club station is located at the Jeep Posse building at 1200 Commerce Drive in Prescott. See the directions listed below. In July 2017, Randy Dashiell W6TYV and Curt Freeman KI7OWL built counter tops and shelves for us at the YARC Club Station shack. 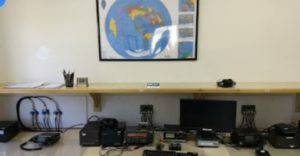 Art Protas KG6AY, Jim Zimmerman N6KZ, Mike Reid N7IEP, Tim Norton K7PVY, and Frank Bender K8FB then re-assembeled the station in our new shack at the Jeep Posse building. Tim K7PVY painted the club station shack the final color. Art and Jim did the bulk of the extensive work required to get the station set up. The station consists of three operating positions. 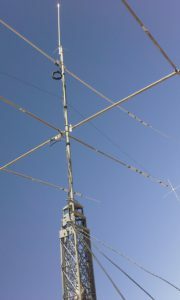 The main station position is a Kenwood TS-570D, using antennas for 160 through 10 meters on all bands except 60 Meters. This station is set up to work SSB, CW, FM (on 10 Meters), and most digital modes, including the new FT8 digital mode. The second position is a TenTec Omni VI, operating SSB/CW, also using antennas from 160 through 10 meters on all bands except 60 Meters. 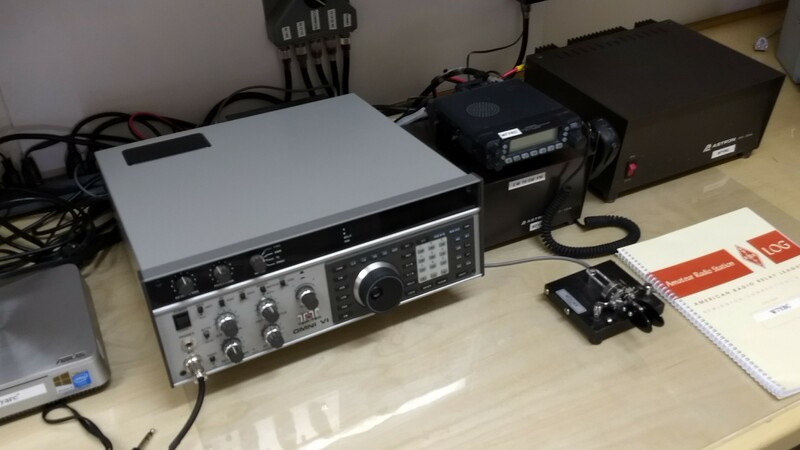 The third position is an ICOM IC-706 Mk IIG, which will primarily be used on 6 meters. Club station antennas include a dual band VHF/UHF Comet X-50, an HF tri-band Yagi (10, 15, and 20 meters) with a 40 meter rotatable dipole extension, a WARC (30, 17, and 12 meters) rotatable dipole, and a 160/80 meter dipole. The antennas are on or supported by our 55 foot crank up tower. 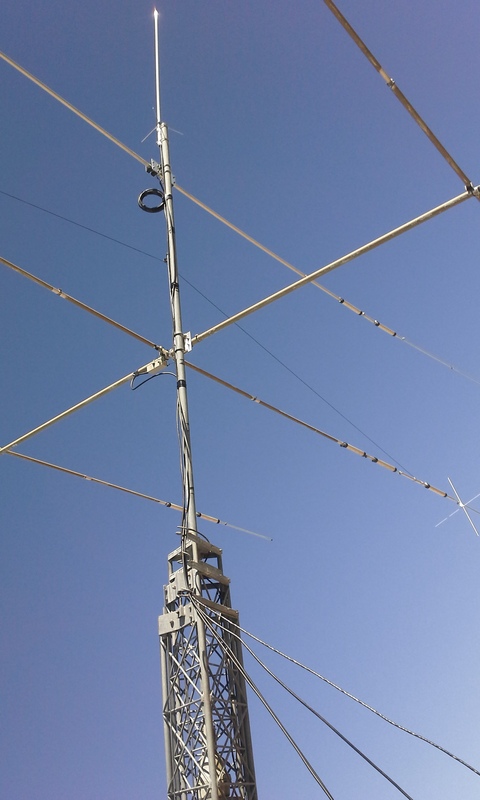 Also on the tower is a 5 element 6 meter beam donated by Pete Morrison K6VVR. We have a Yaesu FT-8100R VHF/UHF transceiver and TNC to utilize Winlink to be able to send email messages via VHF internet gateways in the area. We have the HF and VHF digital modes operational. YARC has a truly awesome club station. It is really something to be proud of. 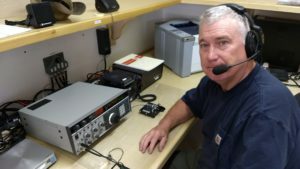 Frank Bender K8FB is the Station Manager (k8fb@w7yrc.org). Pete Morrison, K6VVR is the W7YRC license trustee. Doug Freeman KV8TD is the N7GMH license trustee. Proceed all the way back of the parking lot to the Jeep Posse building. Following is a list of the dates that we have the club station reserved at the Jeep Posse building. Caution: The schedule is subject to change. To be certain the event is still being held, check the web site Calendar and check with the contact person. If you want to operate the club station at a non-scheduled time, you can contact someone on the Access List (See Club Station Documents List below) to have them open up the station for you. Please be respectful of the time of day that you call. First try to contact someone on the Access List who has Access Code = “D” before contacting other members on the list. Be aware, with individual operating access, there could be another event going on when you arrive. In this case, you may not be able to operate at that time. 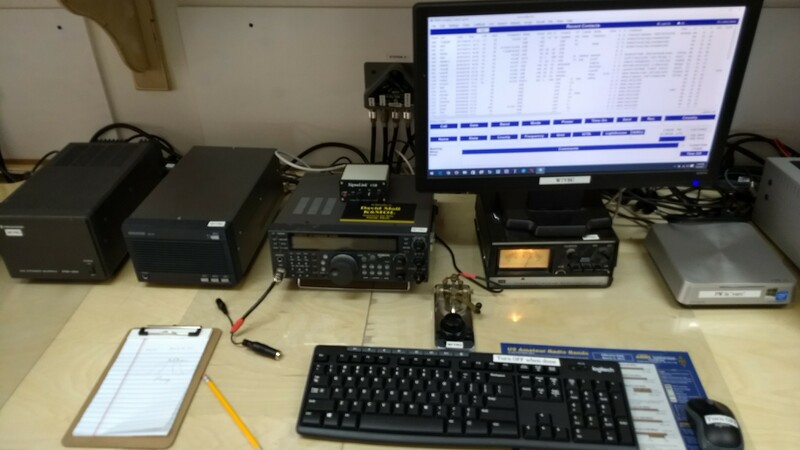 The station consists of a Kenwood TS-570D HF transceiver, with antennas on the 30 foot tower for 40M, 20M, 15M, and 10M. 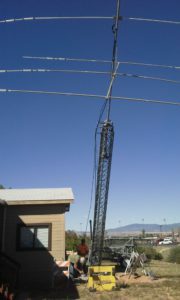 An Icom VHF/UHF transceiver is installed, using a Diamond X-50 dual band vertical mounted on top of the tower. 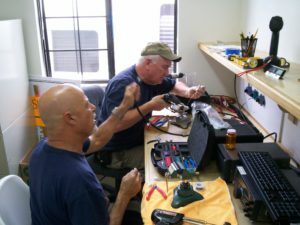 The Icom VHF/UHF will be swapped out this coming week with a Yaesu FT-8100R VHF/UHF transceiver which has a data port so that we can install a TNC to utilize Winlink to be able to send email messages via VHF internet gateways in the area. 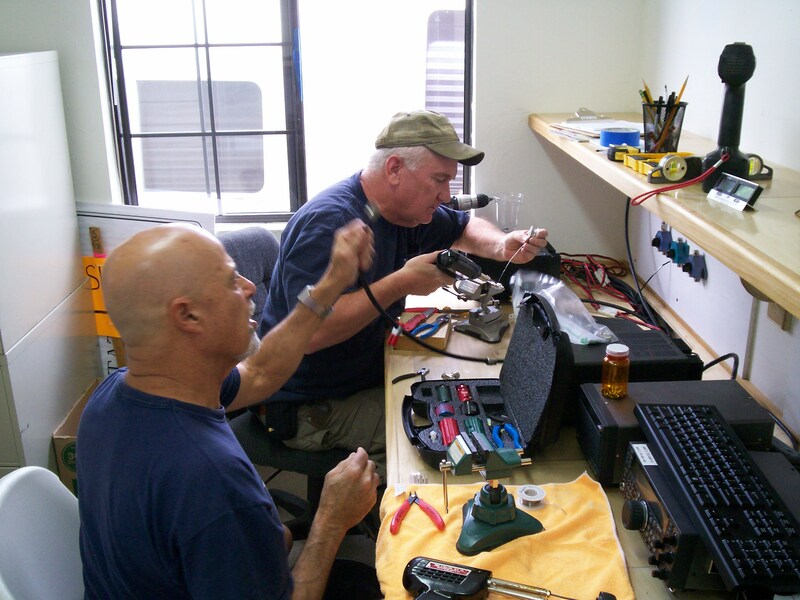 We are planning on having the HF and VHF digital modes operational by the September 19 open house. Our club has entered into a partnership with the Yavapai County Jeep Posse (YCJP) to create a YARC club station at the Jeep Posse building at 1200 Commerce Drive in Prescott. YCJP has allowed us to maintain our club station in the Jeep Posse building into 2022. To operate the station on an individual basis, you will have to contact someone on the station access list to open up the building and station for your use. Once the station is in operation, the club plans on having regularly scheduled open houses where any licensed amateur can visit and operate the station. The Building Access and Usage Rules. Click the link here. The building and station access list. These members have the ability to open up the building and club station. Click any of the pictures below to enlarge them. The tower and antennas are at the upper left of the picture at the corner of the building. We are proud to partner with the Yavapai County Jeep Posse. They allow us to locate our club station at the Jeep Posse building.